Raid Battles in Pokémon Go are always tough but when you go up against a Legendary Pokémon it’s even more difficult. 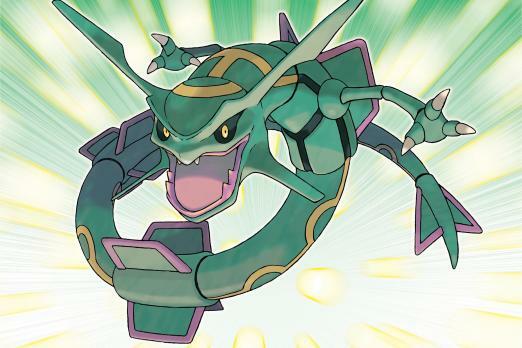 The latest Gen 3 update will bring Rayquaza into the popular mobile game, a monstrous Dragon-type pegged as one of the most powerful in the game. Like the other Legendary Pokémon Raid Battles -- Lugia, Ho-Oh, Legendary Dogs, Kyogre etc. -- there are certain catchable Pokémon that make battle much easier. Whether they can tank hits better or deal the most damage, certain Pokémon are a better match against certain Legendaries in Pokémon Go . Rayquaza is no exception. Pokémon Go Hub has put together an awesome Rayquaza counters guide, breaking down its weaknesses and the best Pokémon to use. The first part of countering Rayquaza is identifying its attacks. Rayquaza has two fast attacks (Dragon Tail, Air Slash) and three charged attacks (Outrage, Ancient Power, Aerial Ace). Understanding these moves will help trainers construct a team to counter Rayquaza. Rayquaza has a monstrous attack (Pokémon Go Hub says its stronger than Groudon and Kyogre) but its defenses leave a lot to be desired. Bring Pokémon that can resist its attacks and deal massive damage, and you’ll be able to breeze through this fight. The Legendary Pokémon also has a 4x weakness to Ice-type attacks, so you’ll want to bring in Pokémon that can use these moves effectively Because Ice-type Pokémon are crucial in this battle. The most effective are: Piloswine, Jynx, Lapras, Walrein and Articuno (if you were lucky to catch one). Outside of Jynx, which is a glass cannon, they can all tank Rayquaza’s hits very well. However, if Rayquaza has Ancient Power Articuno will fall very quickly so keep that in mind. Dragonite is another option as its Dragon-type attacks will deal a lot of damage to Rayquaza, but if you’re facing off against one with Outrage you may want to keep Dragonite in the back. Other Pokémon like Golem, Tyranitar and Gardevoir can also weather some hits while dealing a lot of damage but they are only recommended if you don’t have enough Ice-Type Pokémon to take Rayquaza on. Rayquaza will appear in Pokémon Go Feb. 9 until March 16 so be sure to battle and catch it while you still can. Which Pokémon will you bring into battle? Let us know your setup in the comments section below.